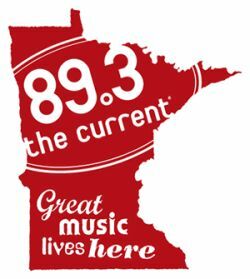 On January 24, 2005, Minnesota Public Radio launched 89.3 The Current with the playing of Atmosphere’s hidden track off the Seven’s Travels album, “Shhh”. “Shhh” is an ode to Minnesota and being proud of where you’re from regardless of what others think of your hometown. It was an incredibly appropriate first track to air on a station who’s mission is to bring its listeners the best new local and national music alongside the music that inspired it. Since that day The Current has held true to its desire to spotlight Minnesota artists through a great number of areas: The Current plays at least two local tracks per hour (usually substantially more); the station presents countless concerts and in-studio performances by local bands, airs a weekly ‘Local Show’; a local band plays each year at the Rock the Garden festival; a 24-hour ‘Local Current’ stream was launched in 2011; a ‘Local Current’ blog was recently created; two volumes of “Local Current” mixtapes comprised of in-studio performances have now been released; and starting with the station’s 5th birthday a party has been held at First Avenue featuring all local acts. This year’s 7th Current Birthday Party was the first to be spread over two nights (January 27 and 28) and featured the expected eclectic mix of artists. The 27th featured Night Moves, Low, Dead Man Winter, and Tapes ‘n Tapes, with the 28th presenting Haley Bonar, Sims, Suicide Commandos, and Poliça. Due in large part to The Current’s strong support of the local music scene, both shows sold out within about 15 minutes of going on sale. This despite the fact that they were initially only available for purchase by MPR members. Unfortunately, real life got in the way for a few minutes and kept me away from the computer at the moment tickets went on sale and I was shut out of the Saturday show. Friday tickets lasted a few minutes longer, though, and I was able to grab two tickets to that show. The concert opened with a performance by Night Moves (discussed in ‘Dispatches from Funkytown #3’), and it is clear from this performance why Domino was willing to sign them despite their having never ‘sold’ an album. Musically the group was remarkably tight for being such a young band, and, after what sounded from where I stood like a vocal imbalance during the opening song, didn’t seem to have any issues playing a larger club venue. The crowd was not as into the music as I might have expected, but I chalk that up to Night Moves being the first band of the evening and the fact that very few people were able to download the album in the brief time it was available. The Current has been playing two songs off the album, but a majority of the crowd were hearing almost all of the songs for the first time. The band closed, as expected, with “Horses” (one of the tracks still available on Bandcamp) and it lived up to its status as the best track on the album, but I was particularly impressed with “Colored Emotions” the album’s ‘title track’ that actually ended up not being on the prior release of the album. According to the band they expect it to be on the reissue from Domino this summer, and as good as the rest of the album is, “Colored Emotions” has single written all over it. The only negative to the performance was some uncomfortable crowd interaction. As surprising as it was to see a young band as musically ready to play a show like this, it was equally unsurprising that they don’t quite have their stage presence down yet. Guitarist/lead singer John Pelant attempted to engage the crowd, but it was clear he didn’t quite know what he was doing and was very uncomfortable with it. Bassist Micky Alfano appeared a little more comfortable with this aspect of the live show, but whether he was talking too quietly or his mic was simply too low it was nearly impossible to figure out what he was actually saying. In the end, though, it’s all about the music and Night Moves will have plenty of time to work on the rest of the show. Accordingly, they receive a B grade from me on the night. Up second was Low, a band I was shocked wasn’t given the closing slot. After seeing the full bill, though, I think there were three reasons they went when they did: 1) The band’s percussion set up allowed Dead Man Winter’s drum kit to be in place early and sped up the set changes; 2) The fact that this wasn’t billed as a Low headlining show meant that their ‘slowcore’ may not have played well as the last act; and 3) the ‘surprise’ end of Tapes ‘n Tapes’ set would not have worked with Low’s drum kit (more on the surprise in a moment). As for the show itself, it is clear that Low has been doing this for awhile and they know exactly what they are doing on stage. I was very concerned during the opening song that I wouldn’t be able to enjoy the set because a lot of the crowd was being terribly disrespectful to the band and talking over the music. When they moved into their second song, “Try to Sleep”, however, those concerns were put to rest. Low had obviously experienced this issue before and didn’t let it affect the performance at all. Most of the rest of the set had enough volume that the talking was drowned out somewhat, the one exception to this being a fantastic rendition of “Murderer” which had me seething at much of the audience. More important than the volume, though, was that I became absolutely mesmerized by the band. “Especially Me” and “Nothing But Heart” in particular were utterly gorgeous and left me with no doubt as to who was the best band of the night. Honestly, the only thing keeping Low from a very rare A+ from me is the fact they were limited to 45 minutes. I wanted nothing more than to pull up a chair with no one else around and listen to them for hours. Accordingly, Low receives an A. The third act of the night is difficult for me to review fully. Dead Man Winter is a side project of several members of Trampled By Turtles, but leans much more country than the bluegrass of the Turtles and I don’t listen to much country. Too much current country music simply sounds like bad pop with a twang to me, so when I do listen to the genre it tends to be older Johnny Cash type music. Dead Man Winter, though, does not sound much like either of these country styles, so my musical knowledge base is rather weak (if MiG authors Kezzie Baker or Bad Thoughts had seen the show I’m certain they’d be able to wax poetic about the music itself). With that disclaimer, however, the show itself was simply average. It’s clear even without knowing the technical ability that goes into playing with Trampled By Turtles, that the band’s musicianship is unquestionable. It was equally clear that these guys are professional performers and have earned their spot on the stage. The problem was that I didn’t feel any passion from the performance except when the crowd got into it during a cover of the Turtles’ track “Victory”. This was clearly not a crowd that usually attends Dead Man Winter shows, or even listens to their music with regularity, so most of the performance was fairly flat. When they started playing “Victory”, though, the immediate crowd excitement clearly had an effect on the band and we got to see what I assume is the real Dead Man Winter live show (this occurred again to a lesser extent when the band closed with “Nicotine” which The Current has been playing recently). The glimpse I did get of what is obviously a talented band is causing me to seek out Dead Man Winter’s album Bright Lights, but this particular performance gets a C rating. The show was closed by Tapes ‘n Tapes, a band cursed with the mixed blessing of being an early blogosphere favorite. Thanks to the buzz surrounding their 2006 debut, The Loon, and the negative reviews of it’s follow up, the band was one of the first to experience the rapid rise and fall now common in the internet age. Based on this performance, however, the group has not only survived this rollercoaster, but has come through with flying colors. If Night Moves appeared to lack some stage presence and seem uncomfortable from time to time, Tapes ‘n Tapes commanded every inch of the stage. From the opening instrumental through “Insister”, which closed their set proper, they blasted from track to track and had much of the crowd dancing (or at least bobbing) along. Plus, they pulled out some brass instrumentation a couple times, for which I am an absolute and unrepentant sucker. It was a tight and very good performance that proved the decision to close with the band was the right one. As previously noted, the need to have Tapes ‘n Tapes close the show was also demonstrated by the surprise ending. The Current is making it a tradition to close its birthday shows with a group sing, and this year Tapes ‘n Tapes frontman Josh Grier led a surprisingly passable cover of “Purple Rain” (YouTube of a portion of the song is below). Joined on guitar by Low’s Alan Sparhawk the band came much closer to pulling off such a brilliantly technical song than I ever would have guessed, and my hat is off to them. On the whole Tapes ‘n Tapes gets a B+ and I advise everyone to go see them when they come to town. They may not have lived up to the blogs’ hopes in 2005-2006, but they are a darn good band.